Dreaming of a gourmet culinary experience in a private setting? Our latest blog post gives you all the details on how to hire a private chef for a night. When you hire a personal chef for a night or for any time of day, discuss the type of event you are planning. Choose a chef with experience in what you want – a buffet table, only hor d’oeuvres or an elegant plated meal. Ask about wine pairings or cocktails to compliment the menu. The entire cost of the event should be outlined including labor, rental equipment, linens, glasses, plates, flatware, tables and tents. The chef can suggest a price per person or a flat rate for the entire event. Being sure you are both on the same page eliminates stress allowing you to enjoy the party along with your guests. A Hawaiian-themed menu, like a luau or tasting regional favorites, would be fun. A private chef Hawaii can suggest menus within your budget and include such things as decorations and entertainment. Arrange for a walk-through of your home with your chef to look at floor plans, kitchen appliances, seating arrangements, choice of bar location, or anything else that may detract from or enhance the experience. An agenda for the day is the best tool to have. Plan for any emergencies or unexpected things like weather, staff not arriving or guests showing up late. First, choose your Hawaii vacation location and contact chefs in the area. Your vacation spot may even have suggestions for you. Check the chef’s website for good credentials including reputable culinary schools and affiliations with prestigious organizations. 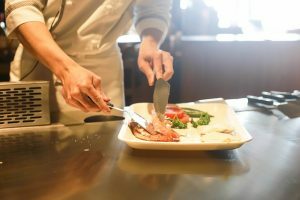 A well-trained chef knows proper cooking techniques as well as health and safety needs. Look for privacy policies, cancellation policies plus terms and conditions that protect your interests. Read testimonials of reputable clients for helpful hints, quality and satisfaction. Videos may be available to watch the chef in action. Contact the chef of choice to get an estimate. Depending on your location, associated costs may vary. Getting menus, ideas and total costing to fit your needs will gauge your comfort level with a particular chef. Make a wise choice from your gut to ensure a worry-free and memorable vacation experience. Private cooking lessons in your own home is a great way to gather friends or family together. Hiring a private chef when staying in the villa in the most popular island like Oahu or Maui to demonstrate new techniques or just to have fun with food allows a small or large group the chance to experiment, learn about food and share great memories. Choices of party ideas can be an Appetizer Party, Easy Weekly Meals, Healthy Living Options, Sweet Treats, Romantic Dinners or a BBQ Bash. Check with your chef for other choices. Make sure you are clear about what the cost of the class includes. In most cases, food cost is not included but a budget decided upon beforehand can keep you on track. When planning for that special day, a private chef can be invaluable and save loads of time and energy. Years of experience provides the chef with the ability to offer suggestions you may not even have thought about. A personalized culinary experience is just perfect for a birthday, goodbye party, retirement celebration, anniversary, marriage proposal and so many other special occasions. 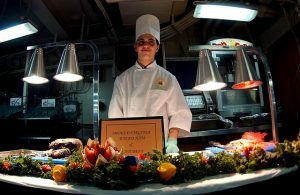 Picking a theme, a unique place (maybe a yacht or on the beach) and the menu to highlight your choices are what a private chef does best. A face-to-face meeting is usually recommended and extras like balloons, party favors or decorations might just be the right touch to bring it all together. First and foremost, make sure your private chef Hawaii is comfortable with traditional Hawaiian foods. If you are on the Hawaiian Islands, many local private chefs are available. Anywhere else in the world it will be challenging to find a trained Hawaiian chef and the ingredients. Discuss whether a traditional Hawaiian luau or regionally-inspired menu is best for your guests. Do you have the space to roast a pig underground? (It can be cooked in the oven). Can you find the right ingredients to make it a truly inspired Hawaiian menu? How much are you planning to spend? Source the ingredients needed. Traditional luau foods include – Poi, Poke, Lomilomi Salmon, Kalua pau’a (roast pork cooked underground in ti or banana leaves), Taro rolls, Laulau, Tropical fruits (mango, pineapple and papaya). More elegant choices for regional foods include – Opakaaka (pink snapper), Moi, Mahi Mahi, Ahi, Opah, Ono, Onaga, Mong Chong, Butterfish, Tobiko, Kabuku Shrimp, Abalone, Opihi and Lobster. Be sure you know what is provided by the chef along with the menu. Adding tropical cocktails, decorative flowers and leis, Hawaiian music and entertainment may be included to add to the experience. Search the website The American Personal and Private Chef Association for trustworthy chefs. Their database covers every state in the US with an approval process ensuring that chefs are professionally trained and well established in their own business.